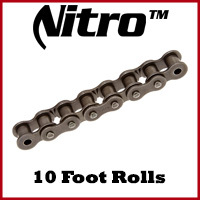 Nitro SP (Super Premium) is stronger than the standard ANSI roller chain. This is achieved by manufacturing the chain from a higher grade steel with more heat treatment. SP chain has a higher tensile strength of about 28% more over the standard ANSI roller chain. The SP chain is generally used in high shock load situations that offers greater fatigue resistance. 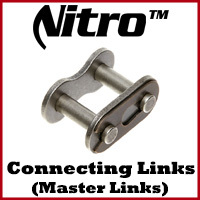 Offset links (Half links) are not available for the SP (Super Premium) roller chain. We do not recommend installing offset links on the Super Premium roller chain.